Brushable waterproofing cementitious mortar that maintains the breathability of the coated surface. 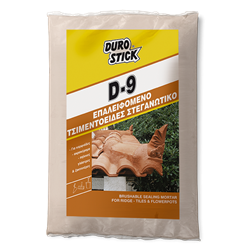 Suitable to be used proactively for waterproofing, or correctively for covering, cracks created on any exposed mortar, after the installation of ridges and antefixes (decorative roof finials). Apply 2-3 coats on meticulously soaked surfaces of clay planters and pots to prevent salt discharges that appears after watering plants. Classified as product for surface protection of concrete surfaces (c), per EN 1504-2.